TCL is one of the world’s leading consumer electronics manufacturers with a presence in 78 countries around the world and has now grown to be one of the most successful television brands in Australia. TCL were excited to showcase their upcoming technology line-up of Smart Televisions for 2018 in the form of a printed product brochure supported by specific point of sale material. Direction was a high end look/feel using lifestyle imagery with neat, simple typography and a colourful, interesting palette. Theme: The Creative Life – Redefined. Brand Solutions worked together with the TCL Marketing Team on ‘Key Visuals’, creative concepts and design and layout. 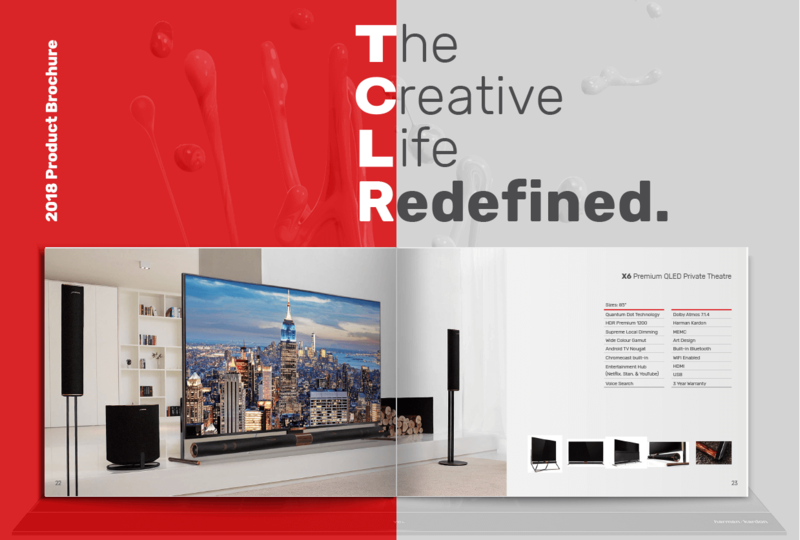 TCL were very pleased with the outcome – a high-end look printed brochure and a dynamic range of eye catching in-store displays that attracted the consumer’s attention and delivered the TCL brand look and feel which complemented the new full range of televisions. We are responsible for designing, building and ongoing maintenance of the Australian TCL website. With each new year comes the launch of a new product range and in turn a new look and feel for the product pages. We made sure we looked at any functionality improvements such as loading speed and mobile responsiveness. We continue to deliver a professional, engaging and dynamic website which has immediately contributed to increased sales for the TCL brand of TVs. The ongoing analytic reports ensure we are always focussed on measuring expected KPIs and monitoring performance. TCL have also invested with Brand Solutions on a full digital media strategy to support their website which builds on their online presence and overall brand recognition. The results speak for themselves with TCL leading their competition in several online activities. “Brand Solutions continue to impress us and have become one of our most trusted partners. Fundamentally, they have the in-house design skill set and digital knowledge required to deliver the work. However, most of all, not for expertise or experience, but for simply, consistently, ‘getting it done’. We see this in their efforts to meet deadlines and continually assist us grow our brand in Australia.